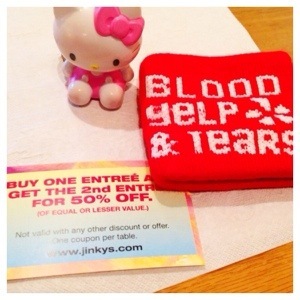 Hello LA West Elite Event Pajama Party at Jinky’s Cafe! 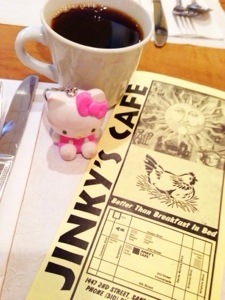 Jinky’s Cafe is a cute little place offering breakfast all day. What better way to enjoy breakfast but then in pajamas. 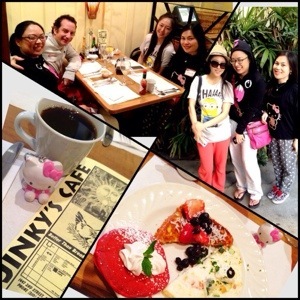 😉 On Monday night, Jinky’s Cafe’s Santa Monica location had a special pajama party for LA West Yelp Elite squad. I was one of the lucky to attend. Many of the Yelpers chose to get a taste of Jinky’s popular mimosas but I chose to get a cup of their freshly ground coffee. Coffee and breakfast is always a great combination and their cup of joe was the perfect partner for the treats we got to try at this event. 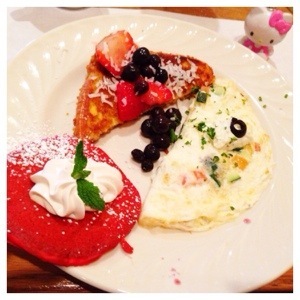 We were served a plate with french garden omelette, coconut flaky french toast and red velvet pancakes. It was a nice trio of some their popular dishes. The french garden omelette consisted of fluffy egg whites with zucchini and tomatoes and boursin cheese. The soft creamy cheese and the fresh veggies made for a very nice omelette. The coconut flaky french toast had coconut flakes, strawberries, blueberries and powdered sugar all on top of egg bread. The coconut definitely made this french toast unique. Out of all the three the red velvet pancakes were my favorite. It had sprinkles of powder sugar and swirls of mascarpone frosting. The red velvet pancakes were deliciously decadent, soft and sweet. Aside from the triple treat dish that we were served, we also got to try various samples of Jinky’s gourmet chili at this event. 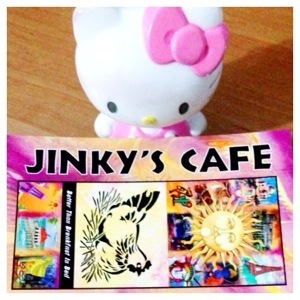 Jinky’s has over twenty different gourmet chili dishes of various flavors and spices. The first chili that we got to try was the Boston Turkey. It’s a tomato- free chili with lean ground turkey and chili pepper puree. 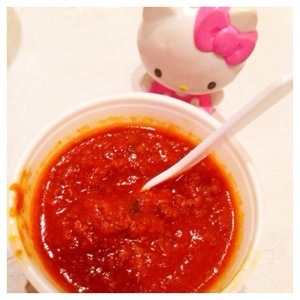 I liked the little chunks of chili pepper that brought an extra kick to the sweet chili. The other chili we got to sample was the Himalayan Beef. This chili had ground beef, garlic, ginger, Serrano and Kashimiri chilies and Indian spices. This was lot spicier than the Boston Turkey. Even with just a small taste, the intensity and hotness came out. We definitely got a nice breakfast spread this night with all the things we tried. Unfortunately we didn’t to try some of their other offerings like some other Yelpers that night but from what we did try it was definitely breakfast bliss for my friends and I! 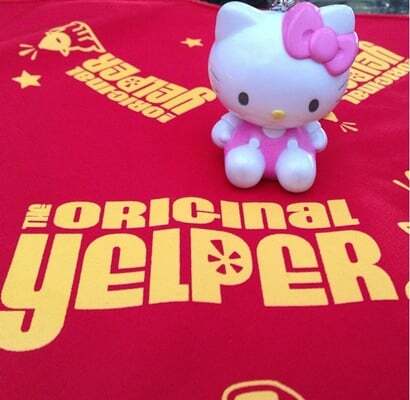 For more smiles, please see my recent Yelp review on the LA West Elite Event Pajama Party at Jinky’s Cafe. Hello Egg-licious Easter Brunch Hawaiian Style!